Background: Knowledge of the risk factors of tooth wear is necessary for the prevention and effective treatment of tooth wear lesions. The objective of this study was to investigate sociodemographic factors and oral habits associated with tooth wear in the elderly in Port Harcourt, Rivers State, Nigeria. Subjects and Methods: The study was an observational research design in which participants were selected by systematic random sampling. Data were collected using pilot-tested questionnaire and tooth wear recorded using tooth wear index of Smith and Knight. Data were analyzed using Statistical Package for the Social Sciences version 20. Multiple regression analysis and Chi-Square test was used to test association between variables. Significance was inferred at P < 0.05 at 95% confidence interval. Results: Tooth wear was significantly higher in males than in females (P = 0.03). There was a significant increase in tooth wear with increasing age (P = 0.001). Individuals with a lower level of education had significant higher tooth wear than those with a higher level of education (P = 0.01). There was a significant association (P < 0.05) between tooth wear lesions and tooth cleaning technique, materials used for cleaning the teeth, toothbrush texture, and consumption of carbonated soft drink. However, the association between tooth wear and teeth grinding as well as frequency of teeth cleaning was not significant (P > 0.05). Conclusion: Consumption of carbonated soft drinks, toothbrushing technique, toothbrush texture, and materials used for tooth cleaning were risk indicators of tooth wear among the elderly population. Therefore, oral health education of the elderly and the general population on appropriate diet and oral hygiene practices is advocated. Tooth wear presents as attrition, abrasion, and erosion. It is the loss of dental hard tissues resulting from chemical or mechanical damage in the absence of caries or trauma., Attrition is the loss of tooth substance due to tooth-to-tooth contact. Abrasion, on the other hand, is defined as the loss of tooth substance by mechanical means other than tooth contact. Erosion is the loss of dental hard tissues by chemical action without the involvement of bacteria. Tooth wear with loss of the enamel and dentin causes damage to the oral health with resultant tooth sensitivity, which may progress to inflammation of the pulpal, periapical periodontitis, and pulp necrosis, thus impacting on the quality of life and well-being of the affected individuals. A number of factors are involved in the etiology of tooth wear; this could be dietary which include excessive consumption of carbonated drinks, beverages, citrus fruits, and hard diet. The maintenance of optimal oral hygiene is dependent on the use of toothbrushes, dental floss, other interdental aids, and chewing stick. Sometimes, abrasion could result from the improper use of these oral self-care methods. Pen and nail-biting and bruxism are other factors reported to significantly correlate with increased incisal or occlusal wear. The prevalence of tooth wear lesions is variable, and studies have shown that it varies according to age, gender, occupational groups, geographic areas, and cultures.,, Tooth wear is reported to be higher among males than females in environments with similar sociodemographic characteristics., Severity of tooth wear was also reported to be associated with periodontal health and oral hygiene status. There are a number of quantitative and qualitative methods for assessing tooth wear. In this study, the tooth wear index (TWI), introduced by Smith and Knight, was used. The TWI is a more general concept for measuring tooth wear irrespective of the cause. The TWI evaluates tooth wear on the cervical, buccal, lingual, and occlusal–incisal surfaces of the mandibular teeth and cervical, buccal, palatal, and occlusal–incisal of the maxillary teeth. The index is reproducible, simple to use, and therefore acceptable for use in the clinic and epidemiological purposes. The population for the present study was retired civil servants 60 years and above. According to the United Nations Population Division report, the Nigerian National Population Commission defines the elderly in Nigeria as person's age 60 years and above. Globally, the number of persons aged 60 years and above is expected to increase from 810 million in 2012–2.03 billion by 2050., This growth in population is immense and would pose great challenges in caring for the aging population. Therefore, considering the increasing elderly population and elderly edentulous becoming less common, tooth wear may become dental problem of great importance in this group., Meanwhile, data on tooth wear among the elderly are scarce globally; the situation is not different in Nigeria. Therefore, the aim of this study was to investigate sociodemographic factors and oral habits as risk factors of tooth wear among the elderly in Port Harcourt, Rivers State, Nigeria. The study would provide baseline information on the epidemiological status and risk factors of tooth wear among the elderly. Knowledge of the risk factors of tooth wear is necessary for the prevention and effective treatment of tooth wear lesions. The study was an observational research design, and the population of the study was pensioners 60 years and above in Port Harcourt, Rivers State. Pensioners were recruited for this study as a representative sample of the elderly to overcome the problem of recruiting elderly from the general population. A minimum sample size of 383 was estimated to be adequate. The assumptions made were prevalence of tooth wear in an adult population of 53%, precision (d) 5%, and confidence interval of 95%. Although the calculated minimum sample size was 383, a total of 543 elderly participants were involved in the study. The participants were selected by systematic random sampling where every second participant was selected from the register of the pensioners. Selected participants who were absent in a particular visit were contacted through their phone numbers to be present in subsequent visit. Data were collected by the use of questionnaire. A section of the questionnaire contained information on age, gender, educational status, parafunctional habits, oral hygiene methods, and dietary habits. Tooth wear was recorded in another section of the questionnaire according to TWI of Smith and Knight. The severity of tooth wear was scored on a nominal scale of 0–4: Score 0: sound tooth with no loss of enamel surface characteristics and no change in contour on cervical region, Score 1: loss of enamel surface characteristics and minimal loss of contour on C cervical region, Score 2: loss of enamel exposing the dentin for <1/3 of the surface and defect <1 mm deep on cervical region, Score 3: loss of enamel exposing the dentin for more than 1/3 of the surface on and defect 1–2 mm deep on cervical region, and Score 4: complete loss of enamel or pulp exposure on and defect more than 2 mm deep on cervical region. Loss of tooth substance on the occlusal or incisal surface was recorded as attrition, on the buccal surface and cervical region as abrasion and on the lingual surface as erosion. The oral examination was carried out at the secretariat of the pensioners using gloves, wooden spatulas, and dental probes under natural light. Cotton wool rolls were used to dry the teeth surfaces to enhance visibility. All the teeth in the mouth were examined; however, impacted third molar, teeth with extensive accumulation of calculus, fluorosed and hypoplastic teeth, teeth with any form of restoration, fractured, and carious teeth were excluded from the study. The reliability of the instrument was done using old people from a location different from where the present research was conducted. This also served as the pilot test for this study. A total of 20 old persons completed the questionnaire and were examined by the researcher 1 week apart. The reliability of the questionnaire was determined using the Cronbach alpha and alpha coefficient of 0.85 was obtained, indicating that the participants quite understood the question items. The recording of tooth wear was done by the first author over a period of 2 years from April 2015 to March 2017. The intraexaminer reliability was determined using intraclass correlation and reliability coefficient 0.81 was obtained. Informed consent was sought from the participant before data collection and the research protocol for this study was approved by University of Port Harcourt Research Ethics Committee. Individuals who retired voluntarily from the Rivers State government public service or retired having put in 35 years of years of service and were below the age of 60 years were excluded from the study. A total of 543 copies of the questionnaire were administered to the respondents and all were retrieved. The completed copies of the questionnaires were collated, coded, and entered into the Statistical Package for the Social Sciences (SPSS) spreadsheet. The data were analysed using SPSS version 20 (IBM SPSS Armonk, New York, USA). Descriptive statistics of frequency and percentage were used to present the results. The relationship between tooth wear and the questionnaire items was evaluated using multiple regression analysis, while Chi-square test was used to determine the significant association between variables at 95% confidence interval. P < 0.05 was considered statistically significant. All the questionnaires administered were retrieved and found usable giving a response rate. Of the 543 participants, 295 (54.3%) were males and 248 (45.7%) were females. The age of the participants ranged from 60 years to 82 years with a mean of 67.6 years. Most of the respondents (234 [43.1%] were 60–64 years old. Regarding educational status, 226 (41.6%), 198 (36.5%), and 119 (21.9%) of the participants had tertiary, secondary, and primary education, respectively [Table 1]. [Table 2] shows the relationship between tooth wear and demographic characteristics of gender, age, and educational status. Tooth wear was significantly higher in males than in females (P = 0.03). Regarding age, there was a significant increase in tooth wear with increasing age (P = 0.001). Participants' ≥70 years had more tooth wear than those between 65 and 69 years. Similarly, tooth wear was higher in the age group of 65–69 years than 60–64 years. Furthermore, educational status was significantly associated with tooth wear (P = 0.01). Individuals with a lower level of education had a significant higher tooth wear than those with a higher level of education. There was a significant association (P < 0.05) between tooth wear lesions and tooth cleaning technique, materials used for cleaning the teeth, toothbrush texture, and consumption of carbonated soft drink. 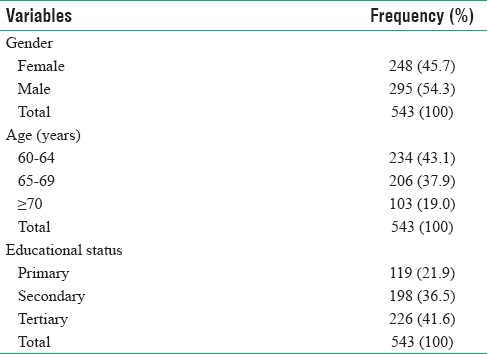 In contrast, the association between tooth wear and teeth grinding as well as frequency of teeth cleaning was not significant (P > 0.05) [Table 3]. The result of the multiple logistic regression analysis is shown in [Table 4]. The odds ratio for gender was 3.89, indicating that the probability of developing tooth wears was about 4 times greater in males than in females. Similarly, respondents ≥70 years old are more likely to have tooth wear about 10 times more than those 65–69 years old, while 65–69 years old had about 8 times probability of having tooth wear than 60–64 years old. The probability of developing tooth wear was approximately 5 times higher in respondents with primary education than those with secondary education and about 2 times higher in participants with secondary education than those with tertiary education. Considering participant-related factors, cleaning the teeth with toothbrush and chewing stick together increased the probability of tooth wear by 10.48 times. Whereas the use of hard and medium toothbrush increased the probability of tooth wear by 6.62 and 4.51 times, respectively, brushing using the combination movement increased the probability of tooth wear by 4.44 times. The risk is higher for combination movement than forward and backward stroke and for forward and backward stroke than upward and downward stroke. 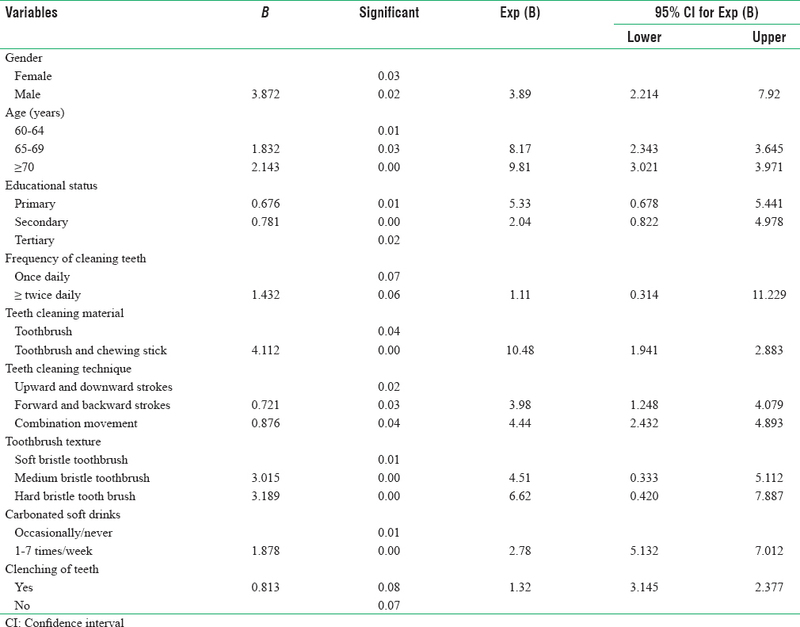 Consumption of carbonated soft drinks increased the probability of tooth wear by about three times [Table 4]. The occurrence of tooth wear lesions varies according to age, gender, oral habits, occupational groups, educational status, geographic areas, and cultures.,,,, Meanwhile, most of these studies were conducted in children and adolescents with relatively few studies conducted on adults and elderly. Therefore, a clear understanding of this condition among the elderly is imperative to increase the awareness and provide preventive and comprehensive management of tooth wear in this group. Multiple logistic regression analysis showed that age, gender, and educational status significantly increased the probability of tooth wear in the study population in the present study. Furthermore, materials used for brushing, brushing technique, toothbrush texture, and the consumption of carbonated drinks also significantly increased the probability of tooth wear among the participants. In the present study, tooth wear was significantly higher in male than in female participants. A study among elderly people in Ibadan, Nigeria, reported similar findings. Other studies have also reported a higher prevalence of tooth wear among males than in females.,, A number of reasons have been advanced for this difference. Males are hypothesized to deliver greater biting force to the teeth than females during mastication, resulting in more mechanical tooth wear in males than in females. Difference in the dietary patterns of males and females is also an important factor. It is reported that, in adolescents and adults, men consume more acidic drinks than females. Higher tooth wear in men than in women may also be due to the difference in the structure of teeth of men and women. However, no evidence that such difference exist, hence investigation of this possible difference is suggested. Studies that have investigated the association between age and tooth wear irrespective of the methodology used and concluded that tooth wear increases with increase in age. This is also in agreement with the findings of Van't Spijker et al., in a systematic review of prevalence of tooth wear in Dutch adult population. The increase of tooth wear with age was expected because tooth wear is irreversible. Therefore, the incidence of tooth wear increases as one gets older. The association could also be as a result of the fact that older persons are exposed over a long period of time to the risk factors of tooth wear and may also indulge in oral health practices that promote tooth wear. This trend was observed in the present study where participants 70 years and older developed tooth wear about 10 times more than those 65–69 years old and those 65–69 years old developed tooth wear about 8 times more than 60–64 years old. Reports on the influence of socioeconomic status on tooth wear is variable; some studies have reported no difference,, while some have reported higher tooth wear in lower socioeconomic class., Ibiyemi and Taiwo also reported that participants without formal education had more tooth wear lesions than those with one form of education. The findings of this study is in line with studies which reported higher tooth wear in lower socioeconomic class. In the present study, participants with primary and secondary education had higher tooth wear than those who had tertiary education. This might be attributed to the fact that individuals with lower educational status know less about oral health practices such as toothbrushing technique and materials used to clean the teeth that could destroy the teeth. This hypothesis is supported by the findings of this study which showed that individuals who brushed their teeth with hard texture toothbrush, chewing stick, and combination technique had more tooth wear lesions than the others. In the present study, tooth wear was significantly associated with the frequency of consumption of carbonated soft drinks and oral hygiene practices such as toothbrushing techniques, toothbrush texture, and materials used to clean the teeth. Individuals, who consumed carbonated soft drinks, used hard texture toothbrushes, cleaned their teeth using chewing stick in combination with toothbrush, and combined different tooth cleaning methods, had more tooth wear than the others who did otherwise. Similar observations have been reported among Nigerians, and other parts of the world. Improper use of these oral hygiene practices might be responsible for the observed relationship between tooth wear and oral hygiene methods. The purpose of this study was to investigate sociodemographic factors and oral habits as risk factors of tooth wear. Tooth wear increased with increase in age; the older elderly had more tooth wear than the younger elderly. Tooth wear was higher in men than women and in participants with lower educational status compared to those with higher educational status. In addition, consumption of carbonated soft drinks, toothbrushing technique, toothbrush texture, and materials used for brushing of the teeth were risk indicators of tooth wear among the elderly population in Port Harcourt, Rivers State. Therefore, oral health education of the elderly and the general population on appropriate diet and oral hygiene practices is advocated to prevent the development of new lesions while limiting the progression of existing lesions. Mulic A, Tveit AB, Skaare AB. Prevalence and severity of dental erosive wear among a group of Norwegian 18-year-olds. Acta Odontol Scand 2013;71:475-81. Mair LH. Wear in dentistry – Current terminology. J Dent 1992;20:140-4. Scheutzel P. Etiology of dental erosion – Intrinsic factors. Eur J Oral Sci 1996;104:178-90. Al-Omiri MK, Lamey PJ, Clifford T. Impact of tooth wear on daily living. Int J Prosthodont 2006;19:601-5. Umoh A, Azodo C. Association between periodontal status, oral hygiene status and tooth wear among adult male population in Benin city, Nigeria. Ann Med Health Sci Res 2013;3:149-54. Johansson A, Fareed K, Omar R. Analysis of possible factors influencing the occurrence of occlusal tooth wear in a young Saudi population. Acta Odontol Scand 1991;49:139-45. Taiwo JO, Ogunyinka A, Onyeaso CO, Dosumu OO. Tooth wear in the elderly population in South East Local Government area in Ibadan, Nigeria. Odontostomatol Trop 2005;28:9-14. Saerah NB, Ismail NM, Naing L, Ismail AR. 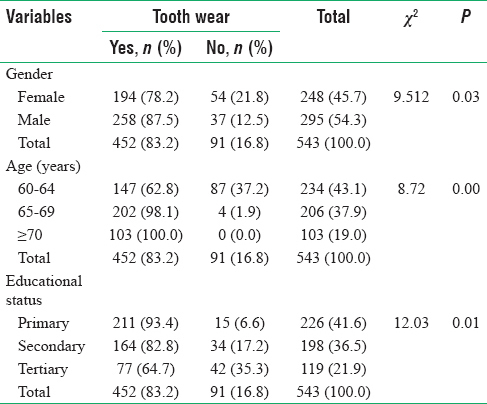 Prevalence of tooth wear among 16-year-old secondary school children in Kota Bharu Kelantan. Arch Orofac Sci 2006;1:21-8. Wetselaar P, Vermaire JH, Visscher CM, Lobbezoo F, Schuller AA. 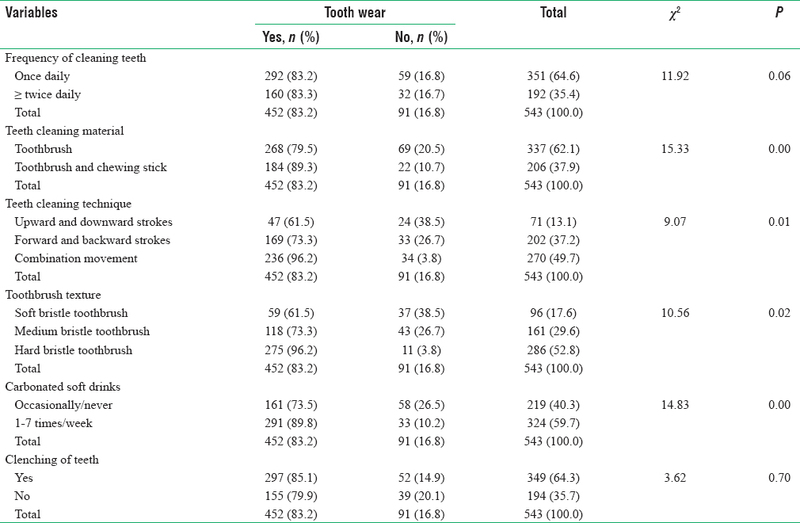 The prevalence of tooth wear in the Dutch adult population. Caries Res 2016;50:543-50. Oginni O, Olusile AO. The prevalence, aetiology and clinical appearance of tooth wear: The Nigerian experience. Int Dent J 2002;52:268-72. Smith BG, Knight JK. An index for measuring the wear of teeth. Br Dent J 1984;156:435-8. Bardsley PF. The evolution of tooth wear indices. Clin Oral Investig 2008;12 Suppl 1:S15-9. United Nation Population Division. World Population Prospect: The 2002 Revision. New York: United Nations; 2003. World Health Organisation. Active Ageing: A Policy Framework. Geneva: World Health Organization; 2002. Ogunbodede EO. Population ageing and the implications for oral health in Africa. Gerodontology 2013;30:1-2. Jaeggi T, Grüninger A, Lussi A. Restorative therapy of erosion. Monogr Oral Sci 2006;20:200-14. Bartlett D, Phillips K, Smith B. A difference in perspective – The North American and European interpretations of tooth wear. Int J Prosthodont 1999;12:401-8. Van't Spijker A, Rodriguez JM, Kreulen CM, Bronkhorst EM, Bartlett DW, Creugers NH, et al. Prevalence of tooth wear in adults. Int J Prosthodont 2009;22:35-42. Ibiyemi O, Oketade IO, Taiwo JO, Oke GA. Oral habits and tooth wear lesions among rural adult males in Nigeria. Arch Orofac Sci 2010;5:31-5.
van der Glas HW, Lobbezoo F, van der Bilt A, Bosman F. Influence of the thickness of soft tissues overlying human masseter and temporalis muscles on the electromyographic maximal voluntary contraction level. Eur J Oral Sci 1996;104:87-95. Hasselkvist A, Johansson A, Johansson AK. A 4 year prospective longitudinal study of progression of dental erosion associated to lifestyle in 13-14 year-old Swedish adolescents. J Dent 2016;47:55-62. Heuer T, Krems C, Moon K, Brombach C, Hoffmann I. Food consumption of adults in Germany: Results of the German national nutrition survey II based on diet history interviews. Br J Nutr 2015;113:1603-14. Ibiyemi O, Taiwo JO. Some socio-demographic attributes as covariates in tooth wear among males in a rural community in Nigeria. Ethiop J Health Sci 2012;22:189-95. Donachie MA, Walls AW. Assessment of tooth wear in an ageing population. J Dent 1995;23:157-64. Okunseri C, Wong MC, Yau DT, McGrath C, Szabo A. The relationship between consumption of beverages and tooth wear among adults in the United States. J Public Health Dent 2015;75:274-81. Steele J, O'Sullivan I. Adult Dental Health Survey 2009. The NHS Information Centre for Health and Social Care. Part of the Government Statistical Service; 2011. Vered Y, Lussi A, Zini A, Gleitman J, Sgan-Cohen HD. Dental erosive wear assessment among adolescents and adults utilizing the basic erosive wear examination (BEWE) scoring system. Clin Oral Investig 2014;18:1985-90. Sunny OA, Philip OU, Amaechi UA. Risk factors for tooth wear lesions among patients attending the dental clinic of a Nigerian teaching hospital, Benin city: A pilot study. Sahel Med J 2015;18:188-91. Hunter ML, Addy M, Pickles MJ, Joiner A. The role of toothpastes and toothbrushes in the aetiology of tooth wear. Int Dent J 2002;52:399-405.